You have InLoox PM 8 installed on your computer, but need help with the implementation? Do not worry – our brand new tutorial series will help you get started. These short videos will be a step-by-step guide on how InLoox PM 8 works. The first tutorial is about how to create a new project and how to use the management form. But first things first, let’s start with a quick reminder of what a project actually is. In short, a project is an action that you do over a period of time designed to achieve a certain outcome. In business, most of the time the goal of a project is to create a product or service. A project has a clear start and end date and also considers other constraints such as cost and resources. A specific set of tasks should be defined and completed to ensure the success of the project. Now to the practical side of things. Creating a new project with InLoox PM 8 is easy. When you create a new project in InLoox PM 8 you can fill in all the necessary project data into the management form. In this tutorial you will learn how the management form is structured and which features are most important for starting a new project. 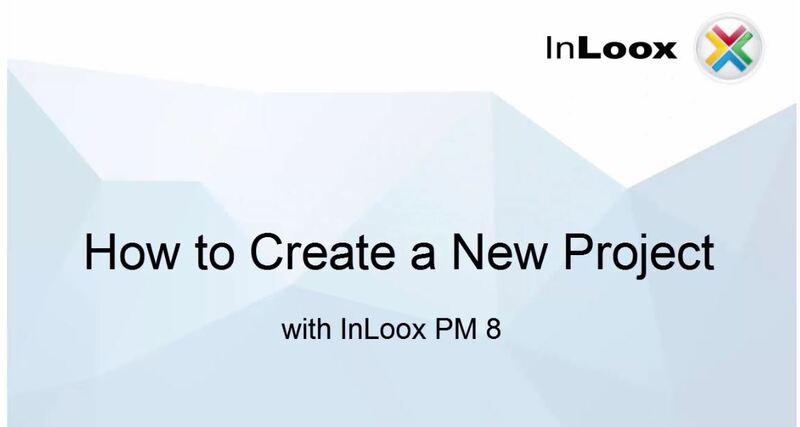 Video Tutorial: Create a Project in InLoox PM 8 - InLoox • Copyright 1999-2019 © InLoox, Inc. All rights reserved.